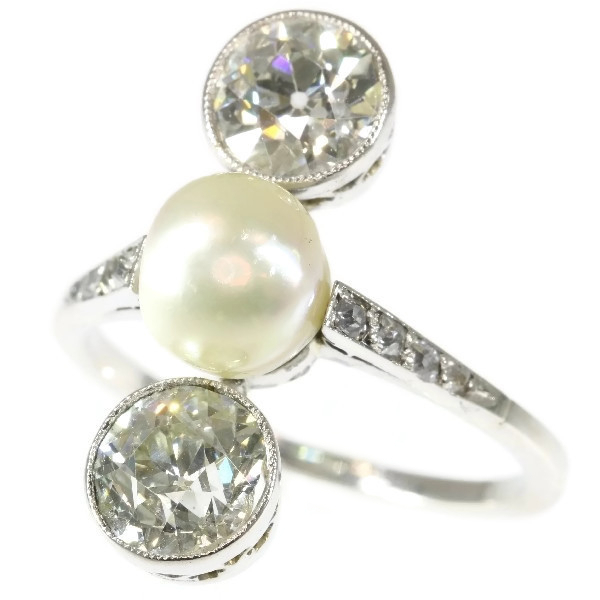 Platinum Art Deco engagement ring natural pearl and big old mine cut brilliants: Description by Adin Antique Jewelry. This platinum Art Deco inline ring is more than meets the eye. The gleam of this natural pearl in its vertical sequence of two old brilliant cut diamonds shows the star alignment of a union meant to be. However, no matter how this all may seem predestined and decently in line, with an antique piece like this you will always stand out. Diamond(s): Two old brilliant cut diamonds with an estimated weight of ± 1.70ct. (colour and clarity: J/K, si/i). Eight old brilliant cut diamonds with an estimated weight of ± 0.10ct. (colour and clarity: G/I, vs/si). Total diamond count: Ten pcs. Total diamond weight: approx. 1.80 crt.